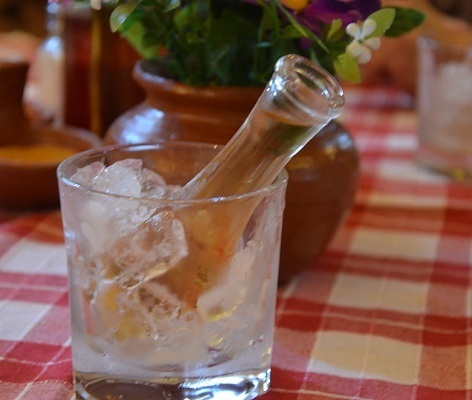 Rakija, Ракија, Rakia is a distilled spirit made from fermented fruit, in other words, brandy. In Macedonia, rakija is generally made from white and/or red grapes, though some areas such as Kichevo and Berovo do make rakija from plums. Rakija can also be distilled from the left-over fruit matter/residue (skin, pulp & seeds) from making wine or squeezing fruit for juice. A common practice with grapes is to first make wine and the use the residue from the wine-press to make rakija. This residue is referred to as grape pomace, marks or must. If the quality of the residue is not sufficient for production, then wine slurry (aka grape lees), the dregs in the bottom of the wine barrel, can be added to the must. Brandy can also be made direct from the grape lees itself. Warning: there are a few in the Balkans that make rakija from fermented fruit with lots of sugar added and drinking this stuff will cave-in the side of your head for at least three days. Two other types of rakija common in Macedonia are mastika and anasonka. Anasonka is rakija flavored only with anise and mastika is rakija that has been flavored with anise, herbs and possibly honey. The purest and smoothest rakija is that which is made from whole pitted fruit without stems and fermented naturally without enhancers such as sugar. This rakija can allegedly be identified by having small clear bubbles at the edges of the surface that can easily be seen when looking at the bottle or your glass. These bubbles are called Venac. Commercial rakija typically has 40% Alcohol by Volume (ABV). Domašna (home-made) rakija can range from 45% to 65% ABV. 50 to 52% ABV has often been identified by our friends and family in Macedonia as the ideal ABV level, my personal preference is 52.5%. What’s helpful is that most green markets in Macedonia or elsewhere in the Balkans, one can purchase a hydrometer to measure ABV. Storage. Commercially produced rakija can be aged in oak or mulberry barrels. Home producers often put their new distillation in glass or plastic bottles which does nothing for the aging (smoothing) of the brandy, and if not properly sealed, can result in oxidation. Rakija that has been aged for less than one year is generally referred to as “immature”. Don’t let the color of the rakija fool you into thinking it was aged in a wooden barrel. Some home producers store their brandy in large glass containers and will insert a stick into the jar to produce a golden color. Some commercial producers may add caramel to give the effect of aging. Most people will proclaim that domašna (home-made) rakija is the best and what one makes in their garage or cottage (weekend house) can be better than anything commercially produced. As Macedonia is seeking to integrate with the European Union (EU), they will probably have to change laws, apply standards such as ISO and it’s beginning to get tougher for people to make their own brandy when factoring for cost & quality, finite supply of grapes and etc. In Macedonia during the 1990s, commercial versions of products typically made at home such as ajvar and rakija, were very few and far between, only a couple of brands and the quality was definitely inferior. Now, variety, marketing and quality have greatly increased. Privatization has increased the number of fruit growers, wine makers and juice makers. Companies that had only made wine or juices are now producing and marketing brandy alongside their other products. As Macedonia undergoes the process to integrate into the EU, the more the pressure that will be applied by external monetary agencies to limit and control the domestic distillation of fruit, not because of food or health safety concerns but as alcohol will become an essential element in the new tax structures to come, i.e. models from the west that will be applied here. Thus such agencies will push to increase the candidate nation’s tax base, i.e. increase tax revenue by taxing alcohol and this will undoubtedly have major impact on the culture here in the Balkans. There are family traditions, recipes and etc that are passed down from generation to generation that are centered around the distillation of rakija. During the last decade, the trend of less domestic distillation and increased commercial production continues. Ten years ago it would have been an insult to give a bottle of store bought rakija as a present. Today, it’s no longer an insult. Currently, rakija is made openly in peoples’ backyards, garages, basements and weekend houses. Neighbors don’t think twice when the other is making brandy and they often share resources and make brandy together. Those that do not have the equipment to distill, will bring fermented fruit and as a gift, or payment for services and use of the still, will leave a couple of liters from their batch to the owner of the still. Many domestic distillers, ferment the grapes and make homemade wine in October – November, and after pressing for wine, they leave the remaining must to continue to ferment until Spring of the following year and then distill the remainder to make rakija.